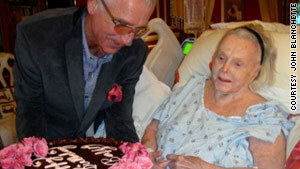 "I've gone through the initial steps of donor matching and blood work and next week the donation process will begin," von Anhalt said.Los Angeles (CNN) -- Zsa Zsa Gabor's husband wants his 94-year-old wife to become a mother again using an egg donor, artificial insemination and a surrogate mother, Prince Frederic von Anhalt told CNN Thursday. Gabor's only child, Francesca Hilton, described herself as shocked when told of the plan Thursday. "That's just weird," Hilton said. Von Anhalt, 67, said he is working with Dr. Mark Surry of the Southern California Reproductive Center in Beverly Hills. CNN calls to the center have not been returned. Gabor has suffered major health problems in the last year, including hip replacement surgery and a leg amputation. She has been unable to walk since a 2002 car accident. "I'm a retired guy," von Anhalt said. "I can take care of it." Gabor talked about adding a new baby to the family when they got married 25 years ago, and she brought the topic up again in recent months, he said. One reason is their desire to have someone carry on the famous Gabor name. None of her two sisters left an heir and her only child does not use the Gabor name, von Anhalt said. Francesca Hilton, 64, is Gabor's only child, the product of her second marriage to hotel magnate Conrad Hilton. She told CNN that her full name is Constance Francesca Gabor Hilton. The process, which includes finding an egg donor and a surrogate mother to give birth to the baby, will cost about $100,000, von Anhalt estimated. The prince, who acquired his royal title when he was adopted as an adult by a German woman, is Gabor's ninth husband. He has complained in recent months about financial burdens caused by his wife's hospitalizations. While he put their Bel Air, California mansion up for sale earlier this year, he said he is not actively marketing it. "In life you need something to live for," he said. "If my wife passes away before me, I have nothing to live for." The Hungarian-born actress, the second of the three celebrated Gabor sisters, is famous for her many marriages and strong personality as well as her acting prowess. Her more prominent films include John Huston's Toulouse-Lautrec biopic, "Moulin Rouge," in 1952, "The Story of Three Loves" in 1953, "The Girl in the Kremlin" in 1957, and Orson Welles' 1958 cult classic, "Touch of Evil."